I first learned this word when I lived on a croft on Deeside in the context of a Bumbees' Byke - or a nest of bumble bees. It also figures in a well-know bothy ballad called the Muckin o Geordie's Byre (or The Cleansing Of George’s Cowshed - that doesn't sound right at all! ), and used to puzzle me in the context of the song in which an escaped pig and the lad chasing it ran into a Bumbees' Byke. I of course pictured it as a bicycle... 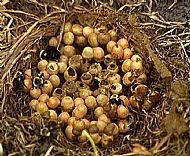 But a real bumble bee nest is shown below. If you would like to see the words of this splendid ballad, have a look at this site.